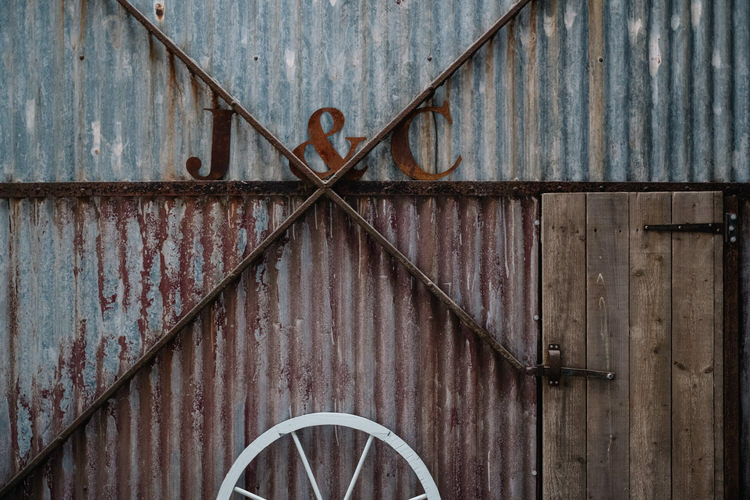 Prepare to be stopped in your tracks with this cool, luxe and fun DIY barn wedding. 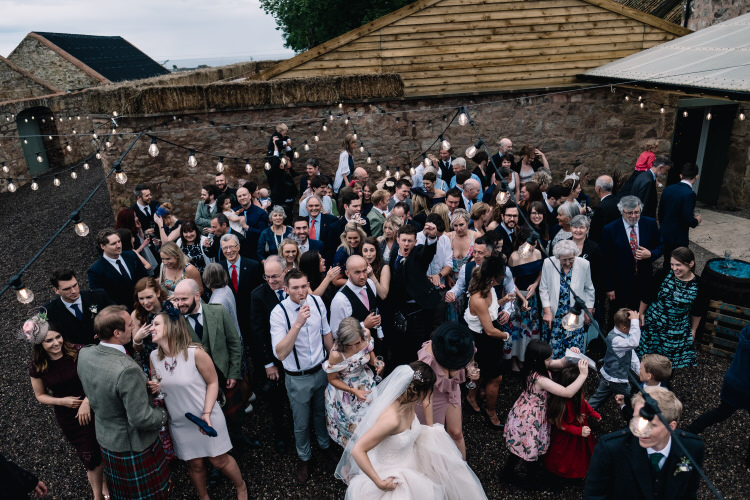 Filled to the brim with twinkling festoon lights, beautiful decorations and a heck of a lot of love. 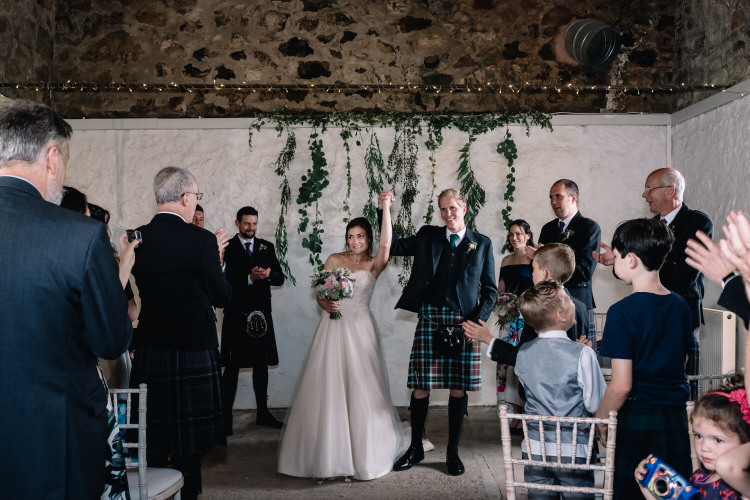 WWW readers Christine and John were hitched on Saturday 5th August 2017 at The Cow Shed in Scotland. 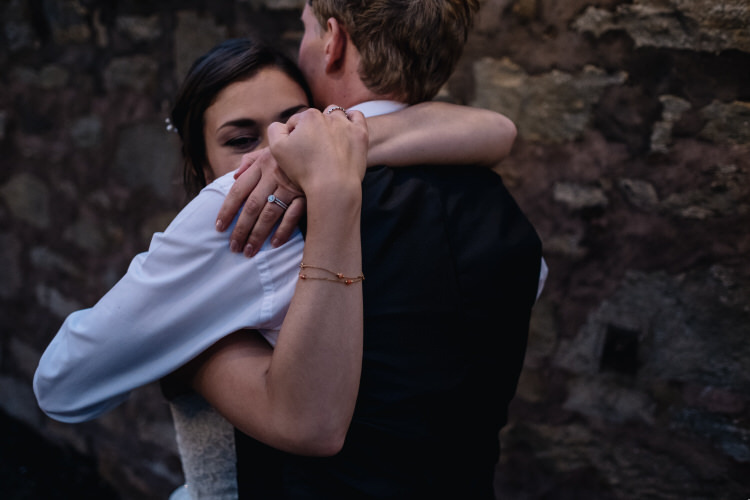 It’s evident from the divine photographs by Harper Scott Photo just how much these two love one another. 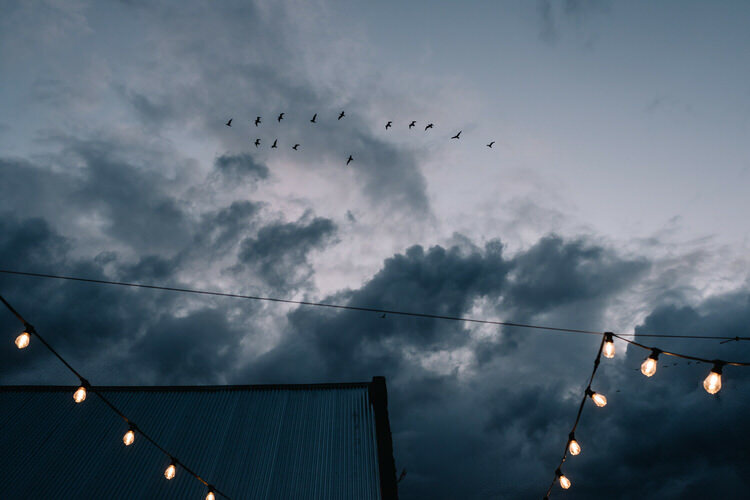 Take the ceremony for instance, they said I do against a gorgeous hanging greenery backdrop; with laughter, tears and all the emotions in-between. 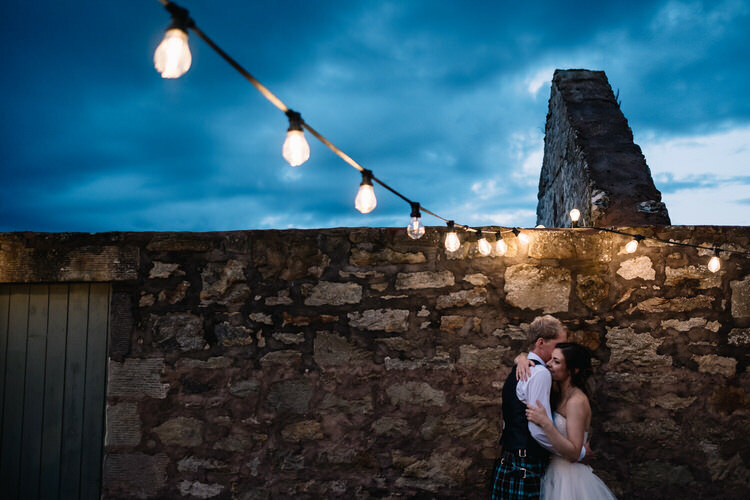 They then headed to the stone barn with a ceiling draped in fabric, for the party. 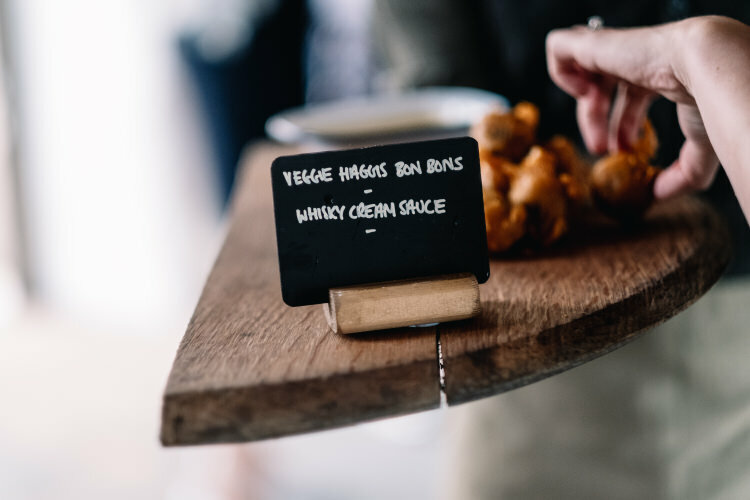 Trays of food were brought to tables by guests, a live band ensured the dance floor was full and crafty touches were scattered throughout. Such fun! 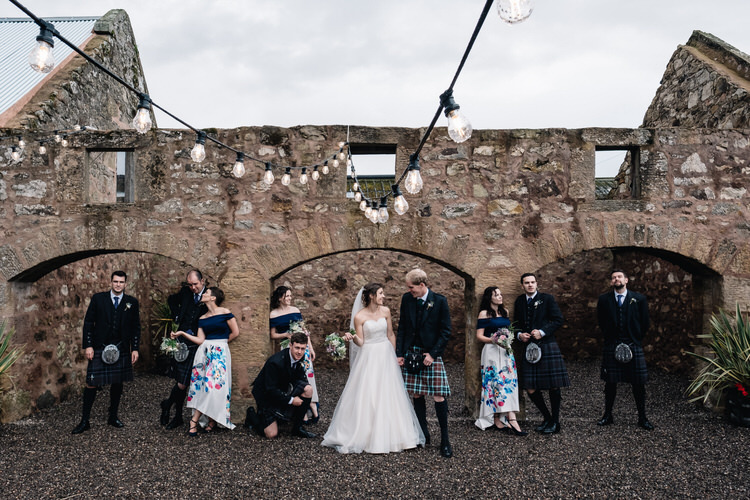 I haven’t even mentioned yet just how stylish the bride and groom looked together with their wedding party, so stunning. 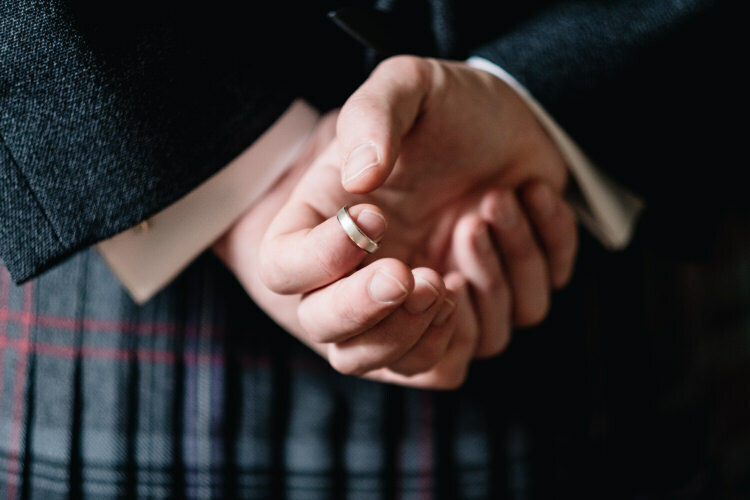 THE PROPOSAL | We were on our way up from Newcastle, where we live, to Edinburgh on Easter weekend 2016, as we were flying from Edinburgh airport the next day to go on a family skiing holiday. Both John and I are fairly keen runners, and I was keen to stop on our way up and do a run in the country somewhere. John suggested we stop at Kielder Forrest and find a trail somewhere, which I thought would be great. We were about a minute into our run when John stopped in front of me and got down on one knee! We were in the middle of the Forrest with a stream flowing below us. John said some beautiful words which I can’t quite remember now because it’s all a blur! After I said yes, and got over the shock a little, we decided to keep going on the trail for a little bit (but just walking – couldn’t quite manage to concentrate on a run after that! ), and just around the corner was a beautiful waterfall, John was gutted he hadn’t waited and proposed there, so he did it all again…! 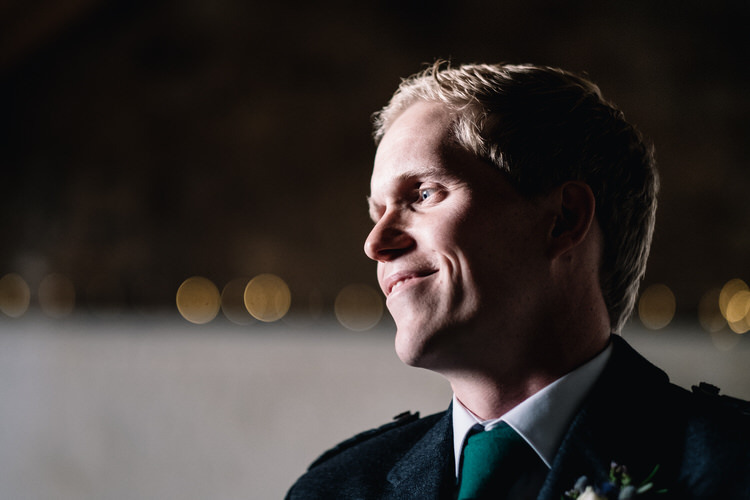 He said afterwards that he wasn’t sure where he was going to propose, and thought about waiting until we got up the Alps somewhere whilst skiing, but he couldn’t risk having airport security finding the ring and it all being ruined, so did it beforehand. He’s always been worried it wasn’t in the ‘right’ place, but I absolutely loved how and where he did it. 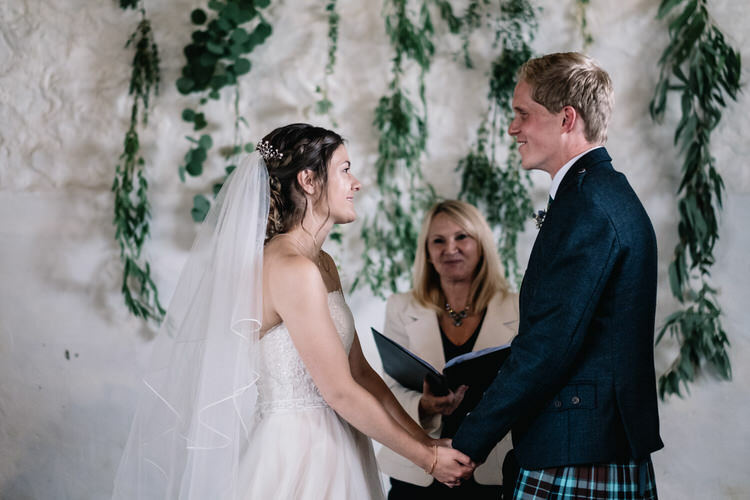 THE VISION | We knew from the beginning that we would love to have the wedding in Scotland, as it’s where we met (Glasgow University), and where John’s family live now (St Andrews), and I’ve always loved Scotland so much. 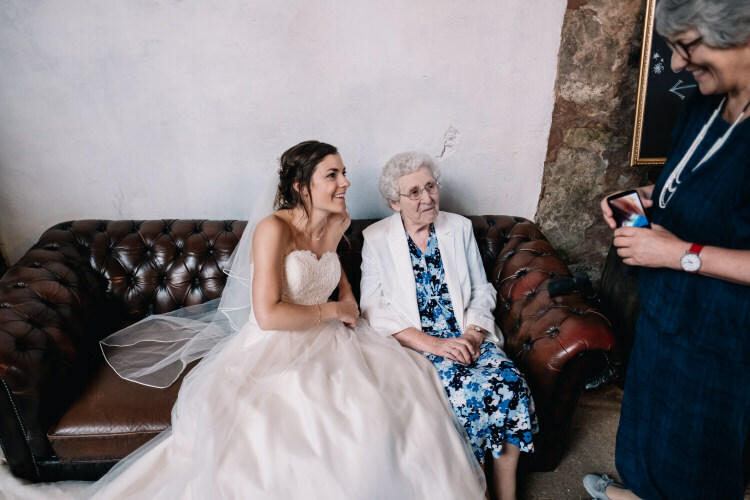 We decided to try and find a venue as close to St Andrews as possible, as at the time John’s gran was elderly and quite frail, and wouldn’t have been able to travel very far. 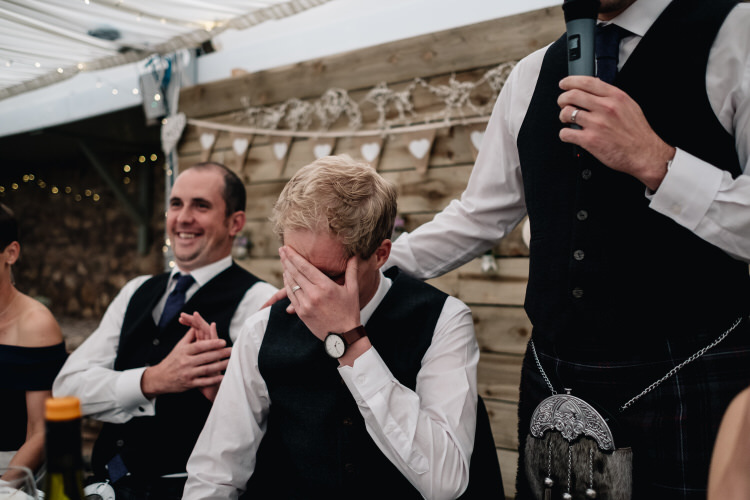 After a few internet searches we came across The Cow Shed, which was being developed and didn’t actually have their first wedding until about six months after we booked it. 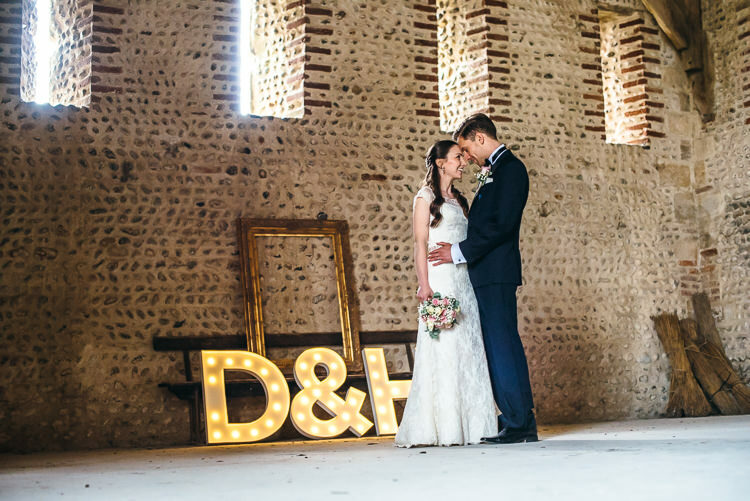 I always loved the idea of a barn wedding, with loads of fairy lights and rustic features everywhere, something a bit different to a stately home feel, which neither of us wanted. 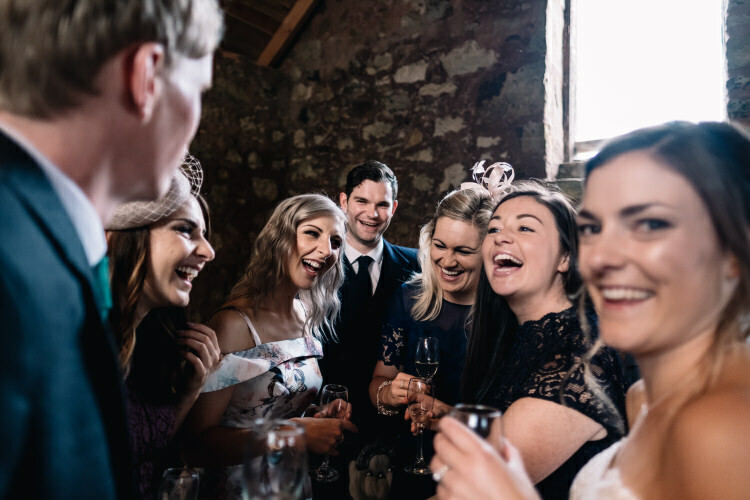 The Cow Shed hit the nail on the head, and we decided to book it pretty fast, after only seeing one other venue. 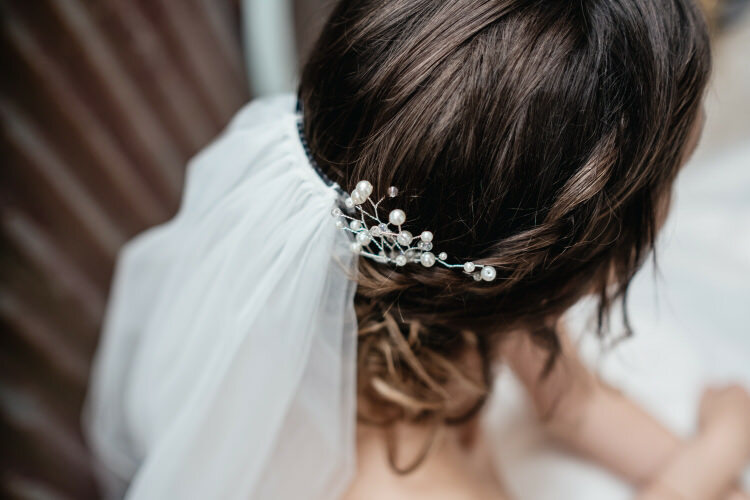 The fact it was so new was a slight worry, but we really loved the idea that by the time our wedding came around, not too many people would have been there. 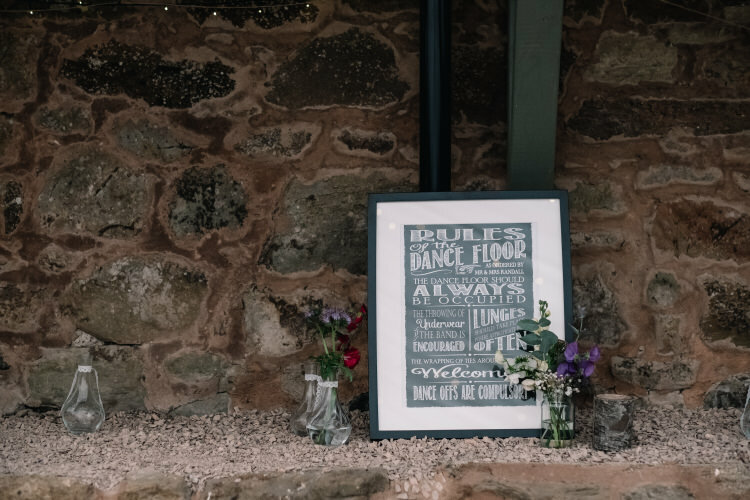 It was also a DIY venue, so we could bring in whichever suppliers we wanted, and do everything exactly as we had in our heads. 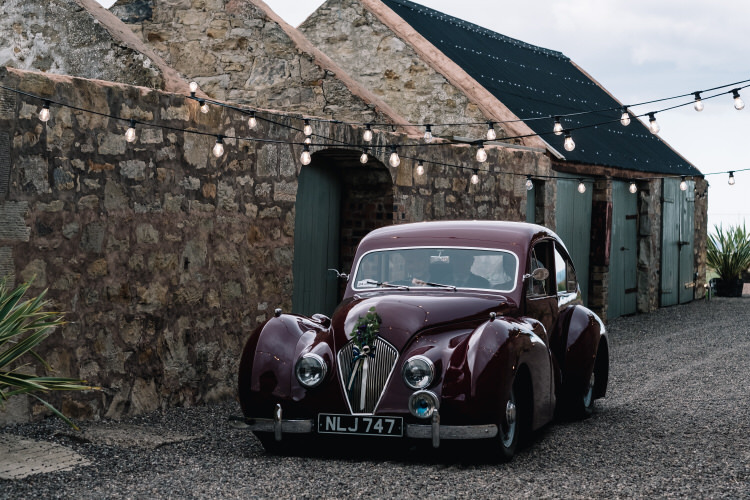 The Cow Shed were brilliant for this, they just let us get on with it, but were always on hand to help make suggestions if we needed and had great links with suppliers. 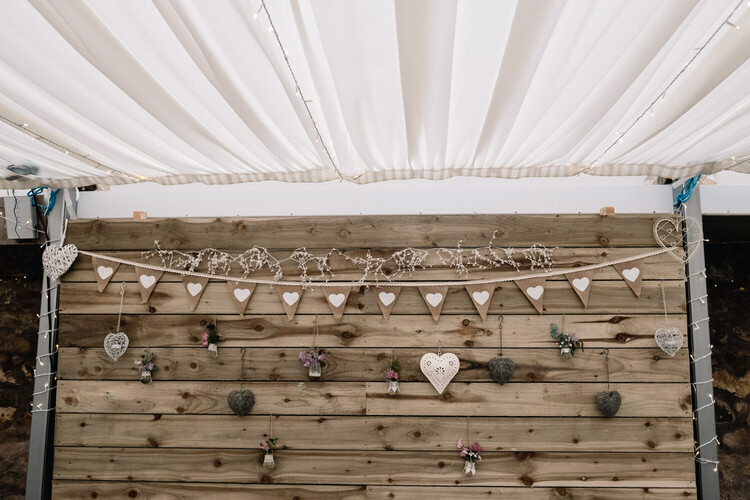 The rustic barn theme ran through everything we did from there on, but perhaps more sub-consciously than anything else! 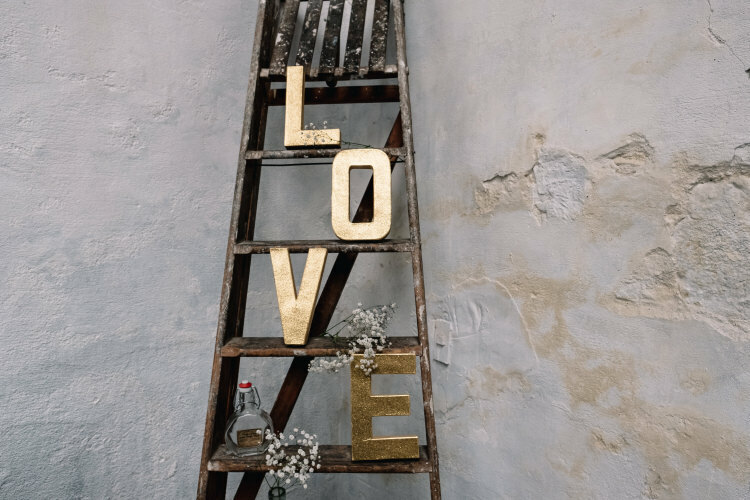 Although there was a lot of planning and Pinterest pinning involved on my part, by the end of everything, it seemed a little as if we fluked everything and it all came together so much better than we had hoped! 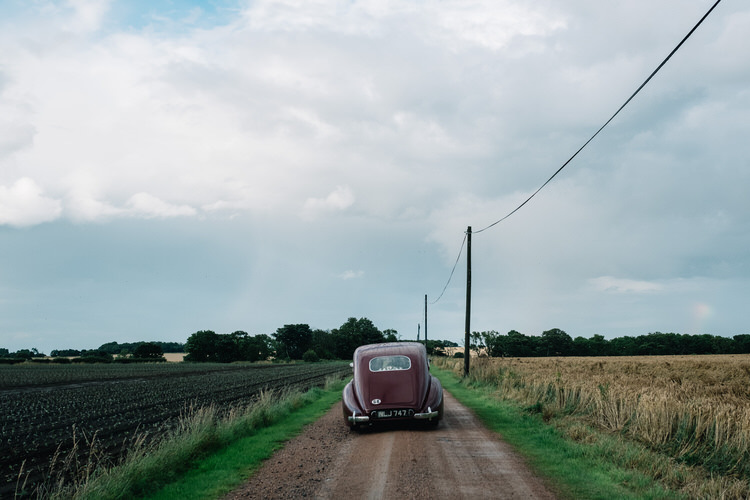 THE PLANNING PROCESS | I felt like the planning process was fairly relaxed, as we had about fifteen months to get everything together once we’d booked the venue. We managed to do little bits at a time, which meant nothing was terribly overwhelming. 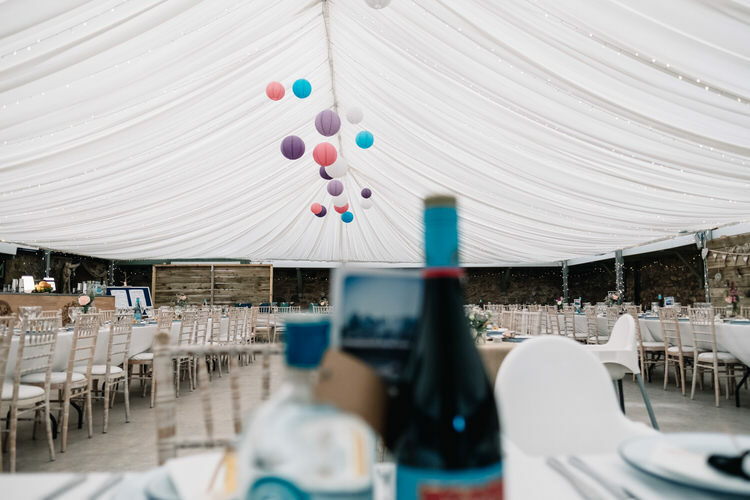 We tried to get the ‘big’ things booked up early, as you just don’t realise how fast caterers, bands, florists, photographers etc get booked up! Then we did all the smaller things, like prop hire, table plan etc just as and when we had time. 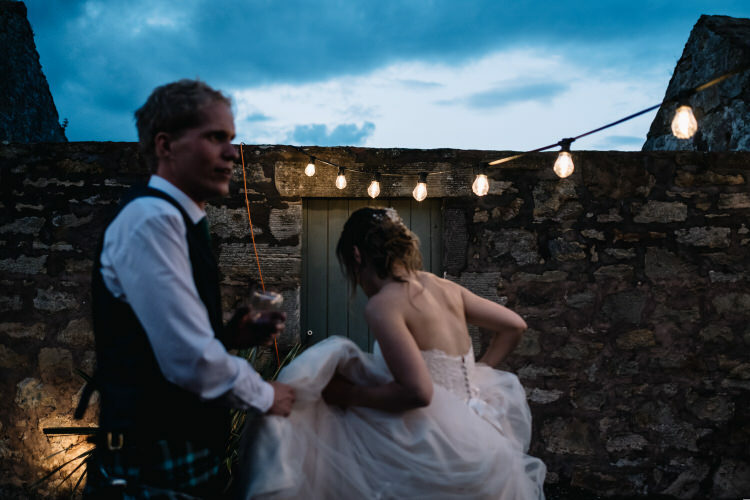 I was constantly looking on Pinterest for inspiration and always had a vague idea of things in my head, though John did start to panic a little a few months out, as I don’t think he realised quite what my vision was and that I had it all planned in my head! 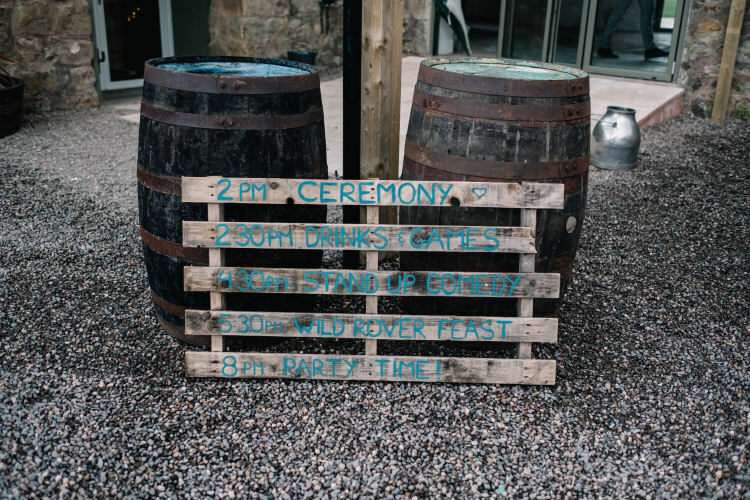 The caterers (Wild Rover Food) were one aspect which we did book fairly early on, we found them as a recommended supplier via The Cow Shed website (this whole list was a god send to us, saved Google searching a lot! ), and immediately loved the look of them via their Facebook page. We then contacted them and got such a good vibe from them via their great correspondence and example menus they sent through. 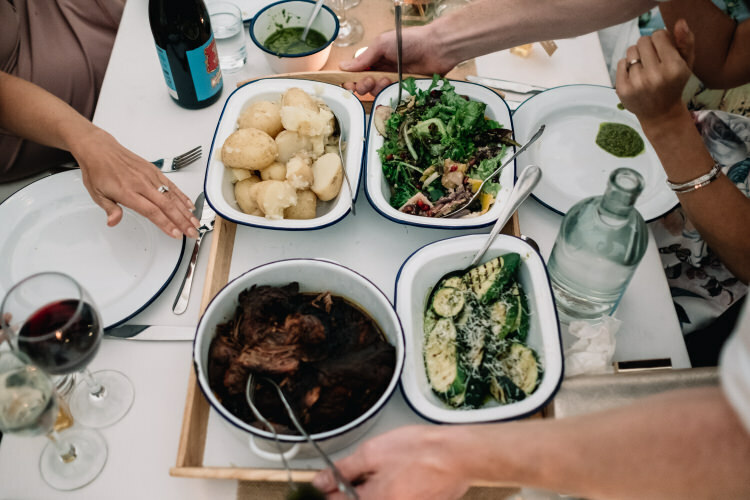 One thing that attracted us to them was the fact that most all produce was locally sourced, and food was cooked fresh on site on the day and the day before. 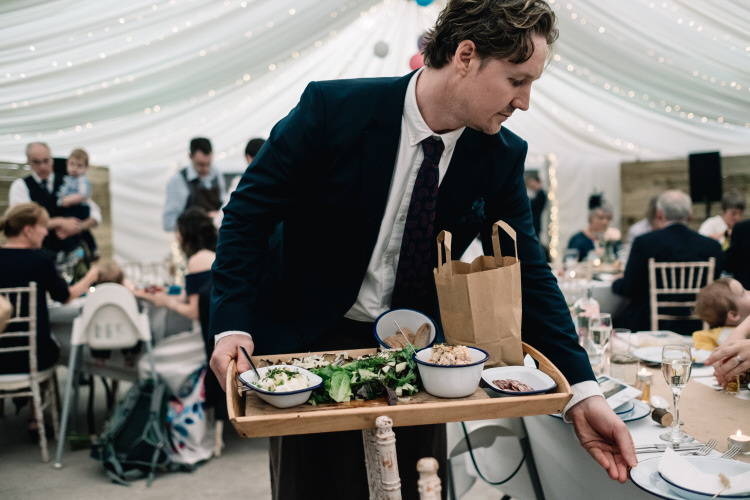 They also served food ‘family-style’, rather than individual plates, and one person from each table had to be ‘waiter’, bringing the tray of food to the table for everyone, we loved the element of theatre and interactivity! Their menus were something that we could discuss with them, and not fixed at all. We only met up with them face to face once, and didn’t even try a sample menu beforehand! But this was one of the outstanding features of the day, and everyone commented on how amazing the food was. 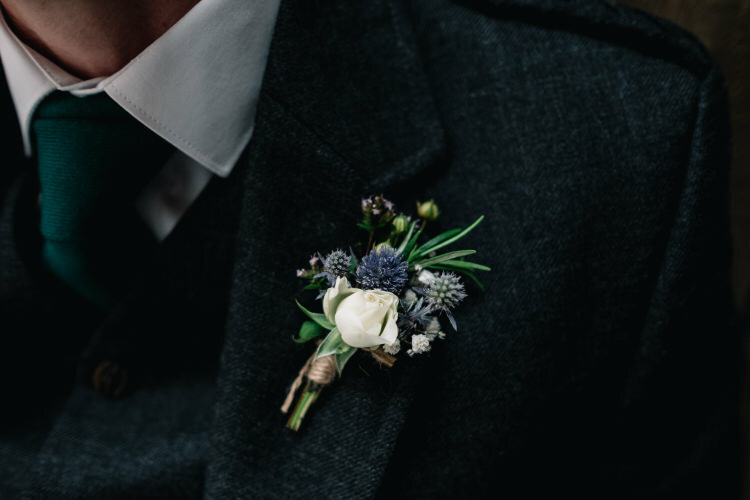 It was all the little details which were so much fun to bring together. I started collecting jars and heart decorations and various pieces quite early on, and loaned as much like that as I could from family and friends. 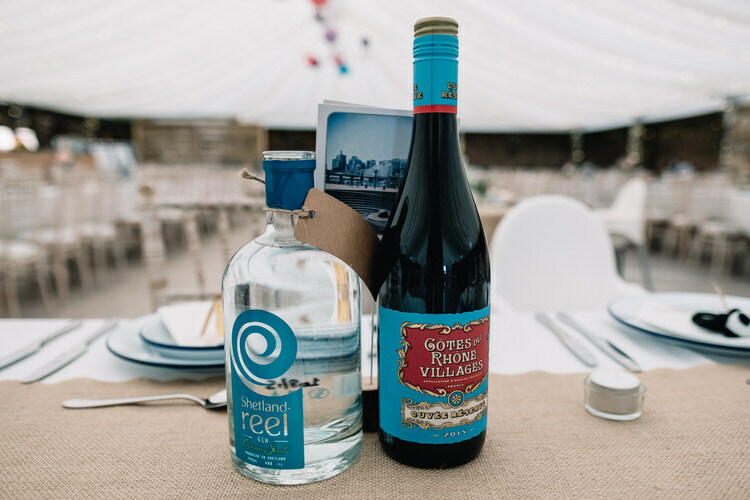 We then sourced other things from a new props company called The Little White Cow (again, suggested by The Cow Shed), and the florist supplied various other things, like the wooden blocks that made up the centrepieces. 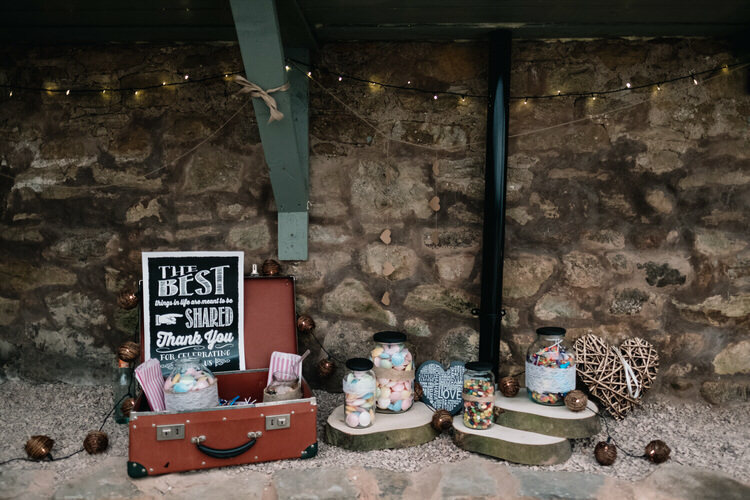 To be honest, all of the little jars and hanging hearts, I only vaguely knew what I was going to do with, it all came together on the day amazingly well! The same could be said of our whole layout of the venue. Although I had even tried to sketch out a scale diagram of the room, and where the tables would go / band / dance floor etc, it still was a bit of a mystery as to how it would all turn out on the day! 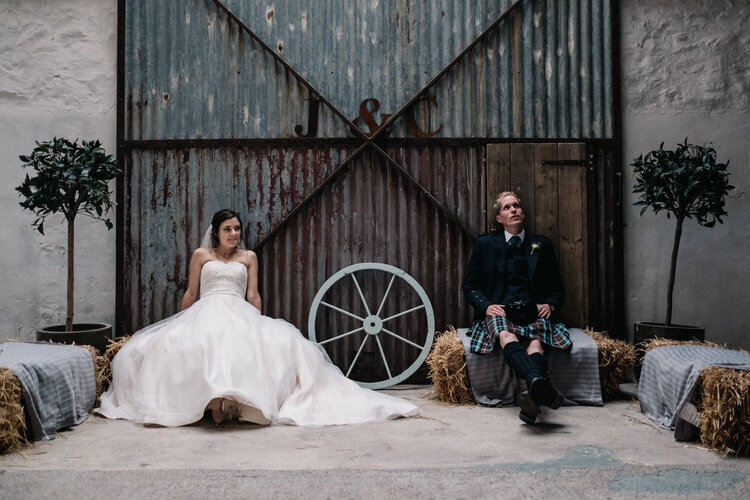 We did have a few conversations with the Cow Shed to make sure everything would fit, and took on suggestions from them as to layout, and constantly examined photos from the previous weddings they had on Facebook, as they came up, to see what other couples had done…but you just never know! 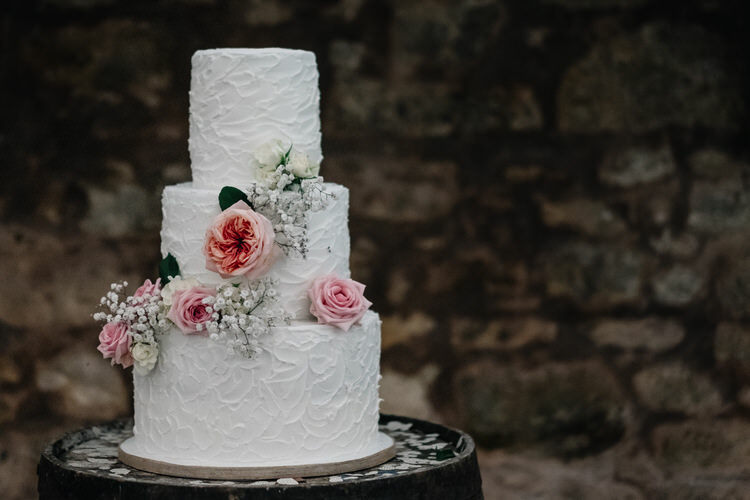 We couldn’t get up to visit often (and only saw the venue twice in person before our day came), so just had to cross our fingers – but it all came together amazingly. BUDGET | Haven’t fully counted it up, but around £15,000 in total. 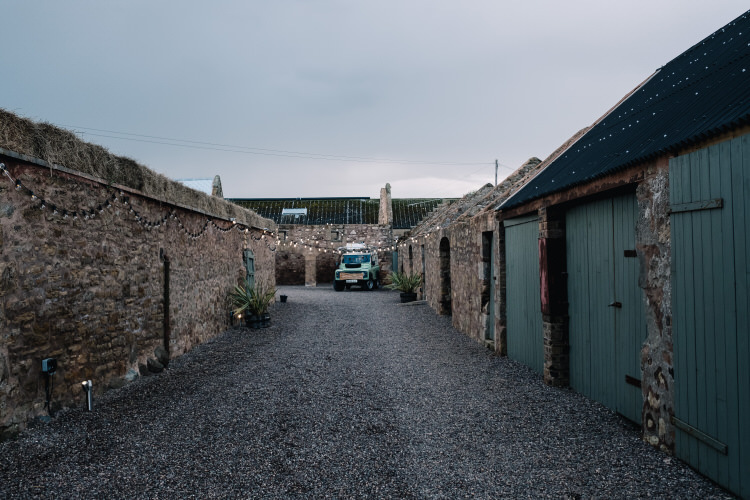 THE VENUE | The Cow Shed, Crail. 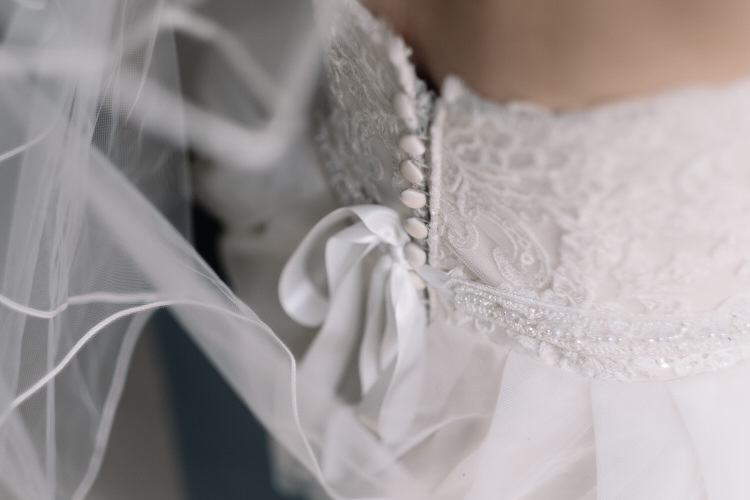 FINDING THE DRESS | This was probably the most stressful of the whole process. 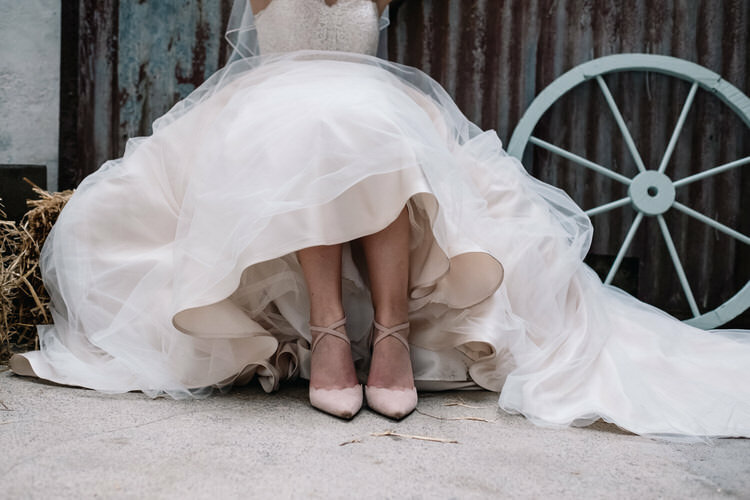 I went to a few dress shops about ten months before the wedding to try some things on, and looked at numerous websites and Pinterest photos, I can’t even count! 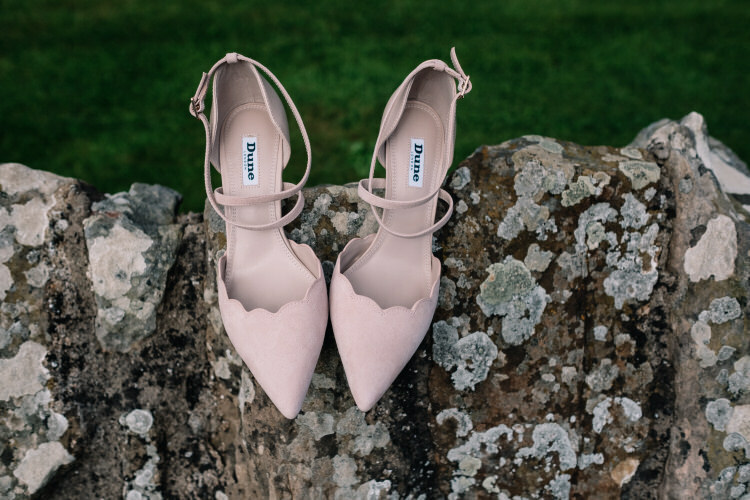 But I was determined not to spend a lot on a dress, at the time I thought more than about £800 to spend on a dress you were going to wear for one day was extortionate. 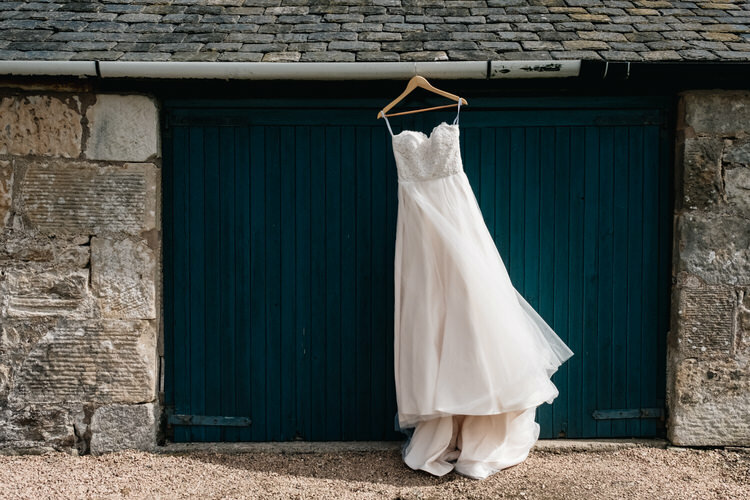 I had my heart set on a dress I’d found online, but when I rang the shop that carried it, they told me it was about £2500, so I couldn’t even bring myself to try it on! I therefore went to a shop called Wed2B, which carries dresses that you just take home on the day, which makes it all a lot cheaper. They didn’t have perhaps as many styles as other shops, but they did keep getting new things in every few weeks. 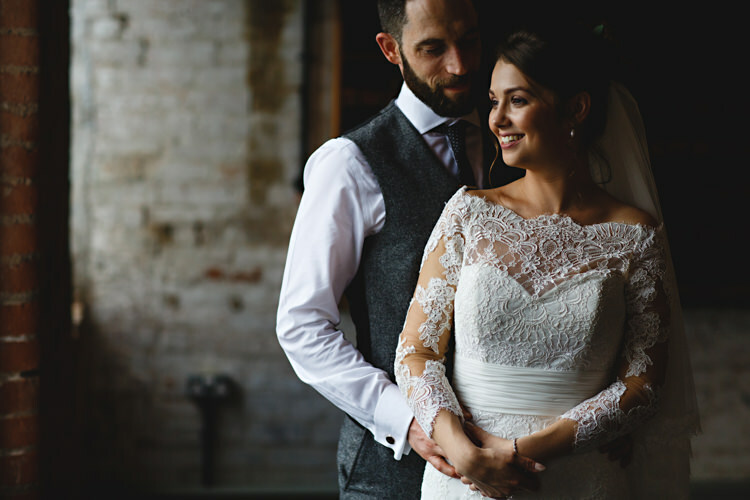 When I tried my dress on, I absolutely loved it and was definitely swayed by the price (£500)! I had to make a snap decision, as they couldn’t hold the dress in my size, and they weren’t returnable, so I just went for it. Afterwards, I really struggled with that decision. I kept looking at other dresses online, which made me think I hadn’t found THE dress… just a nice dress. But I was definitely worried about price, so I didn’t end up doing anything about it. 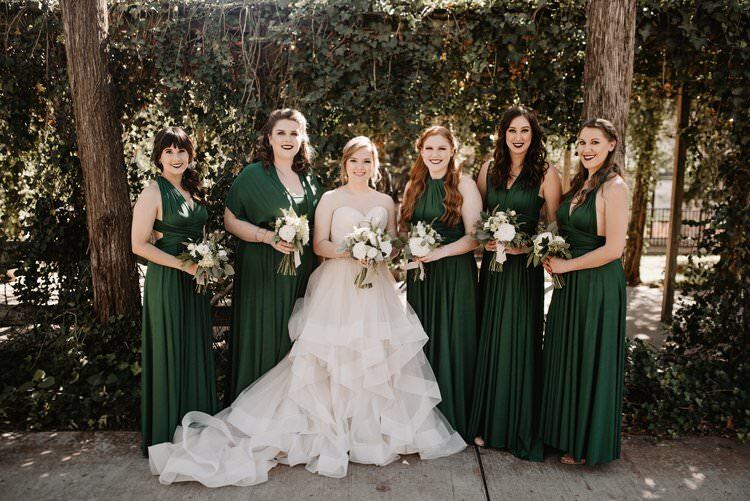 I did love the dress on the day… but if I’m being completely honest, it wasn’t my absolute dream dress. It’s probably the only thing I’d change if I was really pushed. It had the full skirt I was after, and the train (which was a must! ), but I ideally wanted something a bit more ‘boho’ and flowy…though whether that dress actually exists, I have no idea! I guess that’s the reality and practicality of budgeting coming into play. 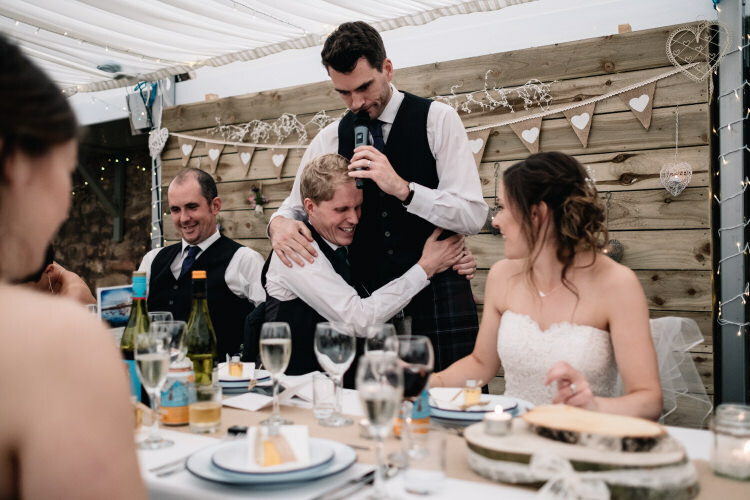 GROOM’S ATTIRE | Own kilt. 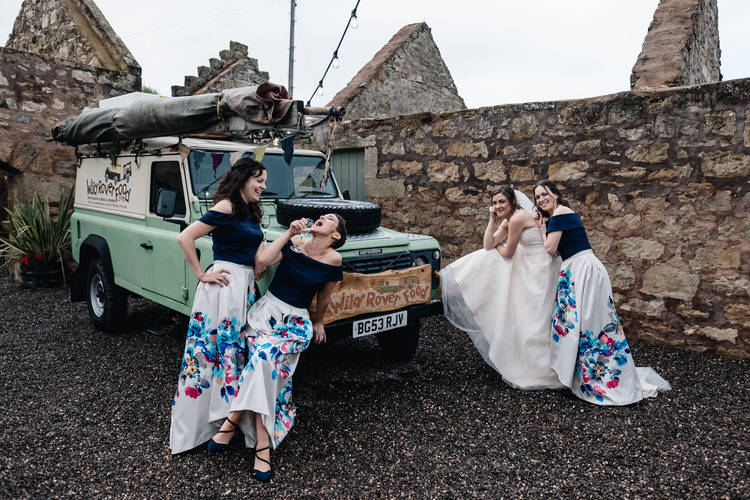 BEAUTIFUL BRIDESMAIDS | Gillian, Emily and Laura. THE CAKE | Homemade by my big sister, Gillian, she put hours of work into it, and it was delicious! 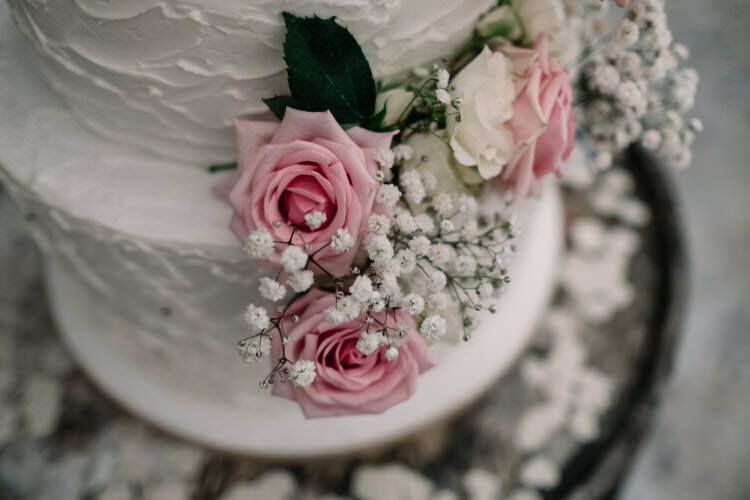 THE DETAILS & DÉCOR | We used The Little White Cow for different props such as the Chesterfield Sofa (for my granny mostly, you cannae put your granny on a hay bale after all! 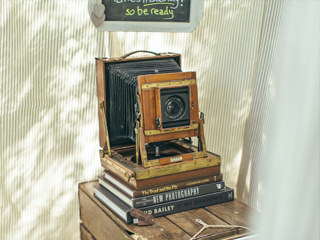 ), the hay bales, ladder, LOVE letters and chalkboards. 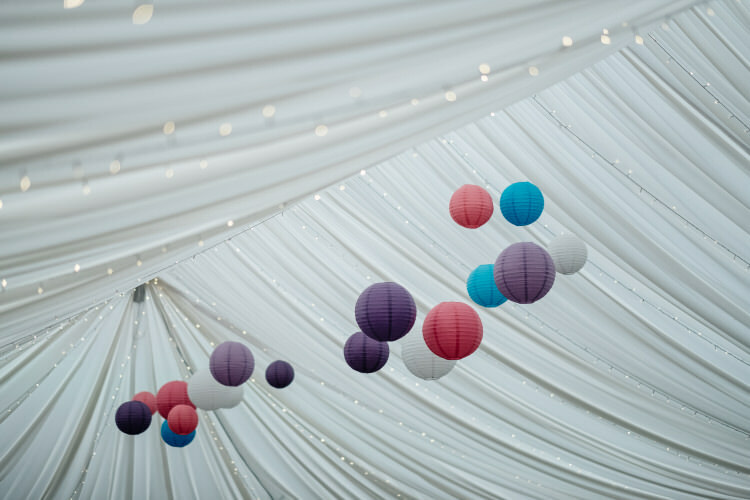 They also hung our colourful lanterns from the barnquee ceiling, as we had to have someone professional do that. They did an amazing job! 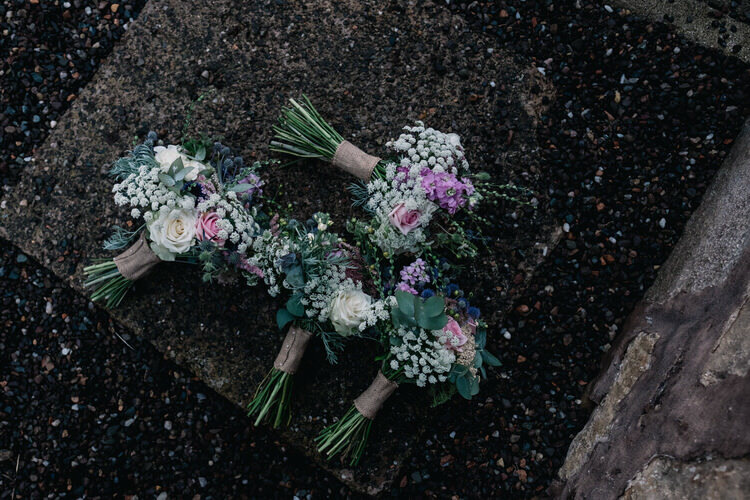 Our florist was amazing. I literally just gave her a budget I wanted to stick to and an idea of what I wanted, and she did the rest! 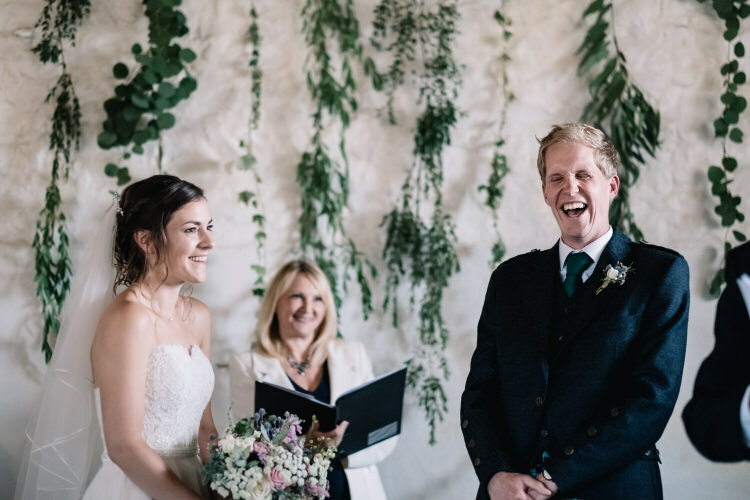 I absolutely loved our foliage hanging as a backdrop to the ceremony. 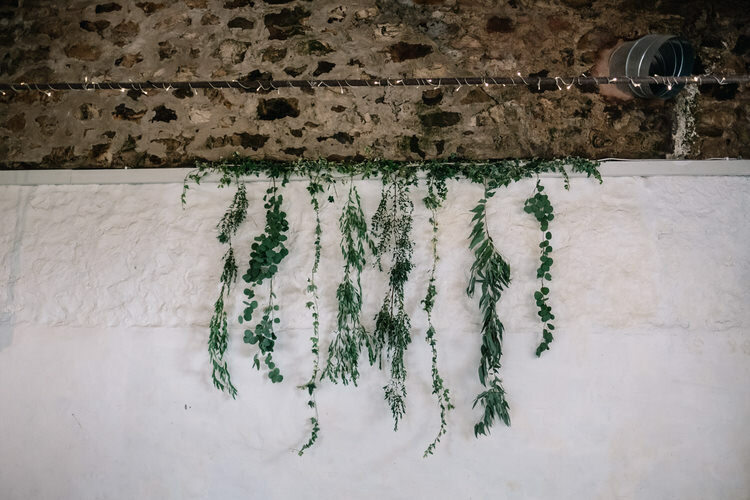 We were going to do foliage actually stuck to the wall, but the florist had been to the Cow Shed a few weeks beforehand and tried that for a photoshoot, and didn’t work terribly well as it didn’t stick as well as it should have. So she came up with the hanging foliage instead, which looked spectacular. 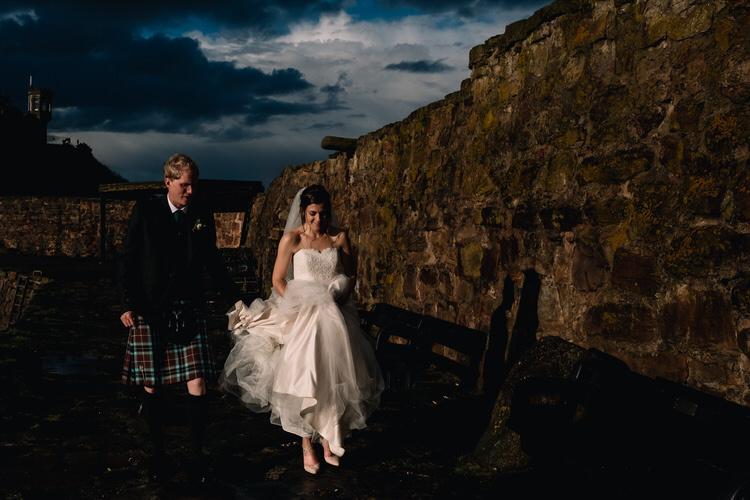 This doubled into the backdrop of our photobooth we had in the evening. A lot of credit has to go to our friends and family who helped put everything together on the day before. 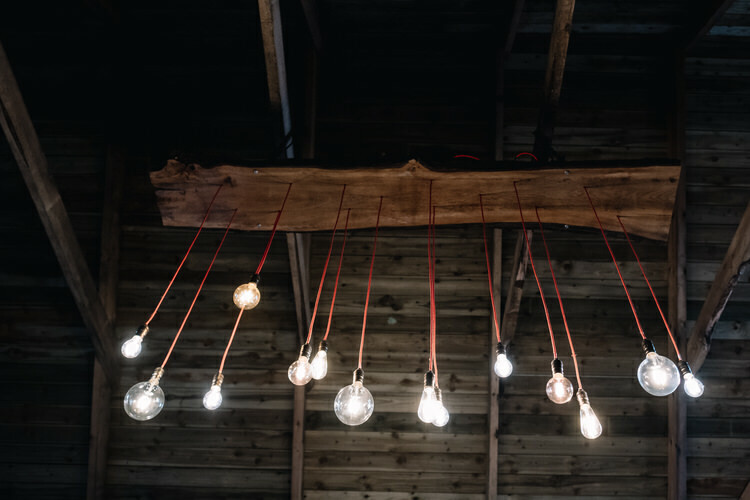 I have a few friends with such a good eye for décor and utilised them fully! 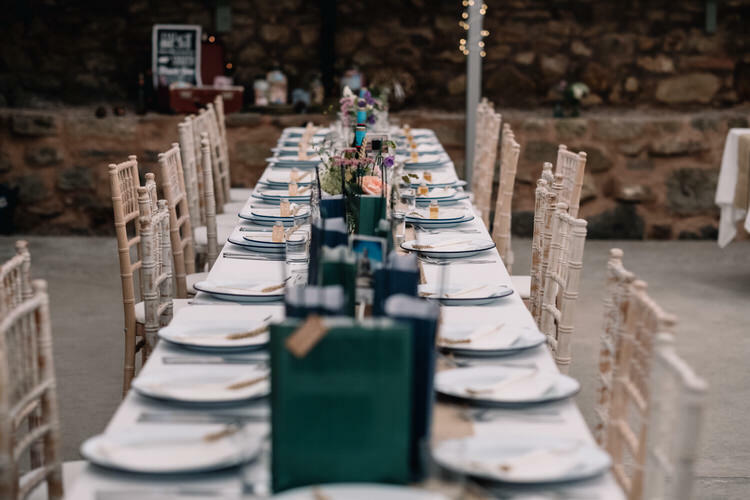 My friend Sarah was the one who thought of using sprigs of hay to lay on the plates, so she plucked it from the fields at the Cow Shed, and it just became a last minute detail! It really brought everything together. 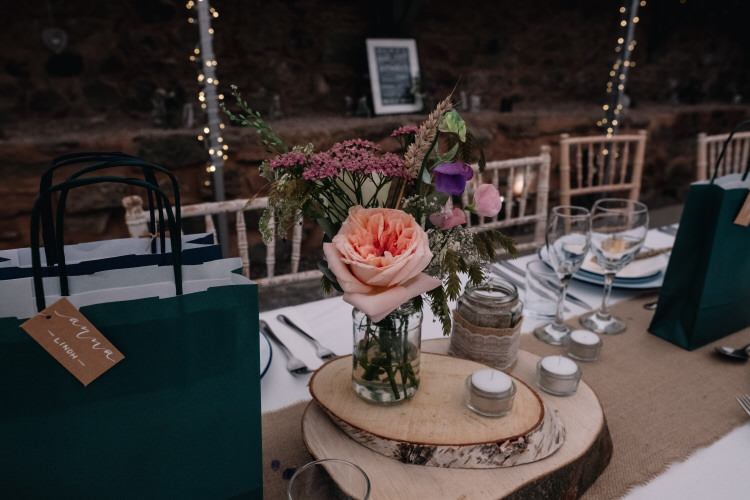 I knew I wanted the tables to be quite rustic, but simple, so just chose glass jars with a small bouquet of flowers, which the florist put together, and some jars and tea lights on the wooden blocks. 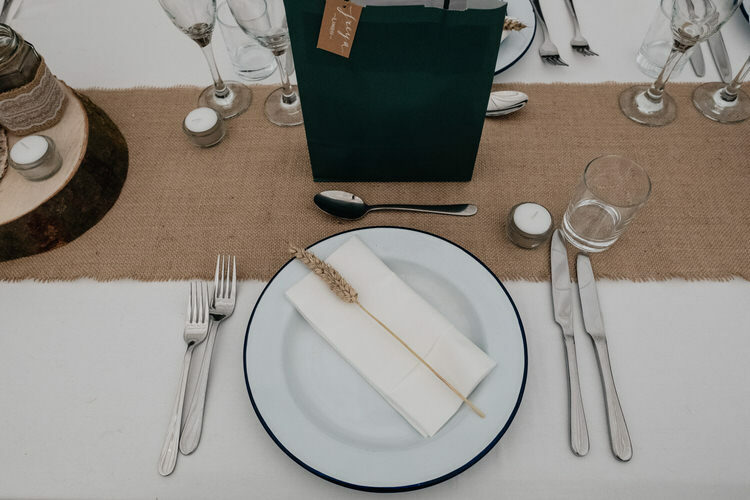 As well as the look, I actually needed it to be simple for the practical reason that we were having trays and big plates of food served, so needed the middle of the tables to have room to set this. The lighting was a huge thing for me. 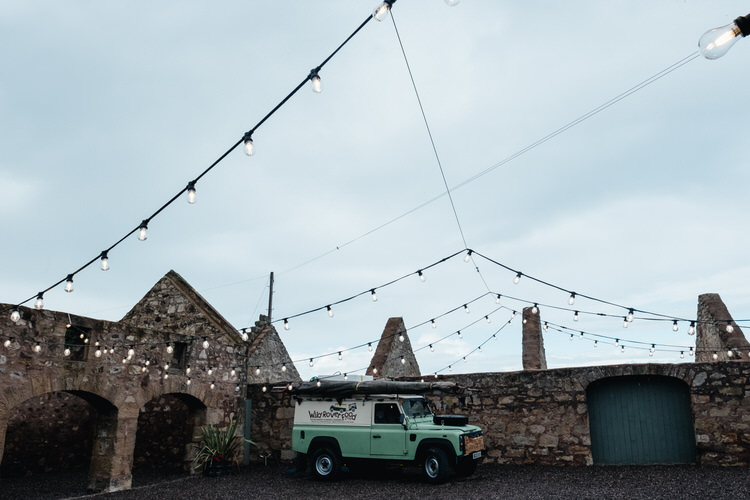 I thought it would really bring everything together and create a lovely atmosphere, so brought in a lighting company to hang fairy lights from the barnquee ceiling and festoon lights outside in the courtyard. We were slightly worried this was going to be a waste during the daylight, and not be able to see them, but you absolutely could, and because our day was overcast during a lot of it, they worked even better. 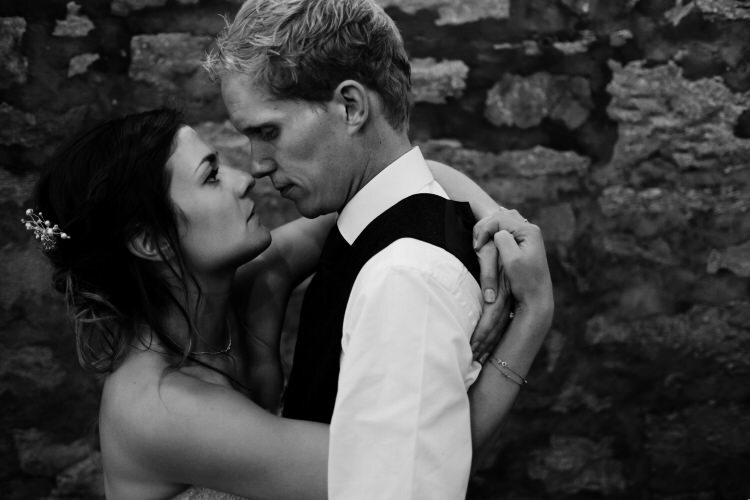 Our photographer, Carole-Ann, fully utilised them in her photos, which I loved! 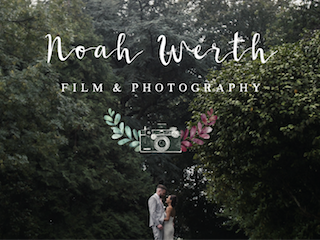 THE HONEYMOON | This was John’s big moment, we decided early on that it would be really fun if he booked it all as a surprise for me. 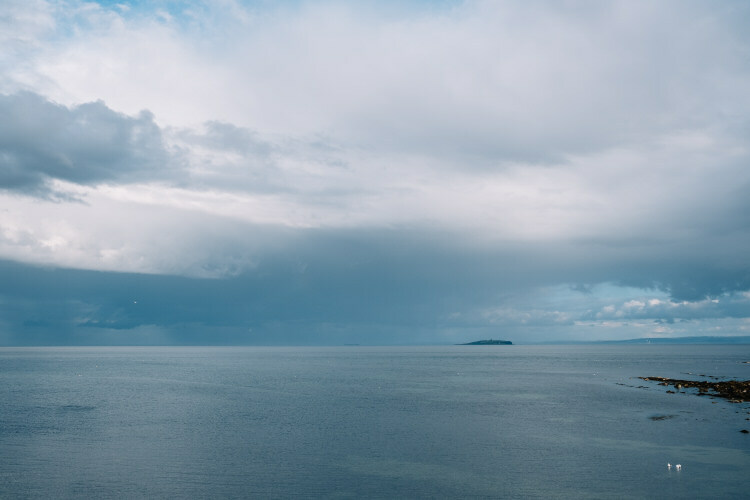 I was absolutely up for this, as meant one less job for me, and I love surprises and I absolutely trusted John as he has always managed to find brilliant hotels and little spots to go to. In the end, I found out at Edinburgh airport, just before we checked in, that we were going to Miami, the Florida Keys and St Lucia! Absolutely perfect, we had a bit of sightseeing time, but also relaxing time by the pool and at the beach where we could just chill out. I always wanted to go to the Caribbean and John absolutely fulfilled that dream! He completely threw me off the scent quite a few times in the lead up, but absolutely pulled it off. 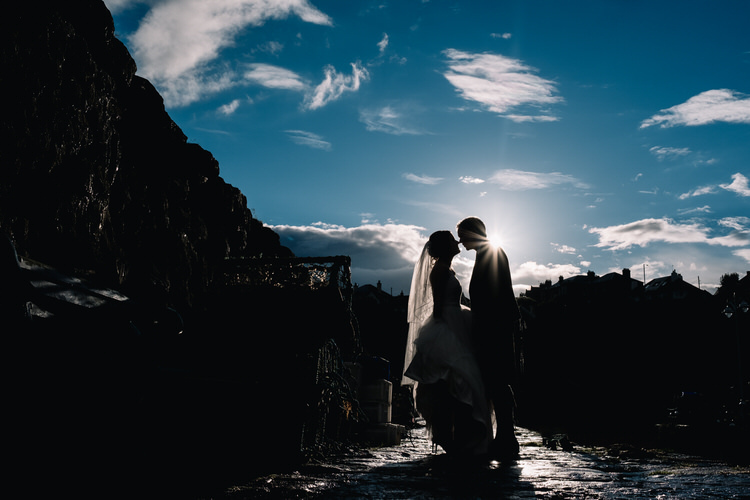 MEMORABLE MOMENTS | The whole day was amazing, it’s really hard to pick out just a few moments. But so was the lead up and afterwards. I really wanted it to feel like a weekend wedding, rather than just a day, so having friends and family get together even on the Thursday before, then do help decorate on the Friday, wedding on Saturday, and another get together buffet lunch at John’s parent’s house on the Sunday made it such a memorable occasion. 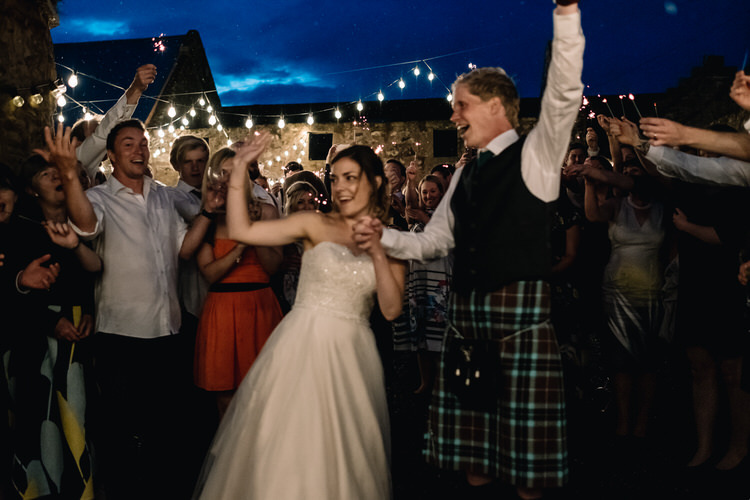 Stopped us feeling too deflated after the wedding as well, as we just carried the party on! 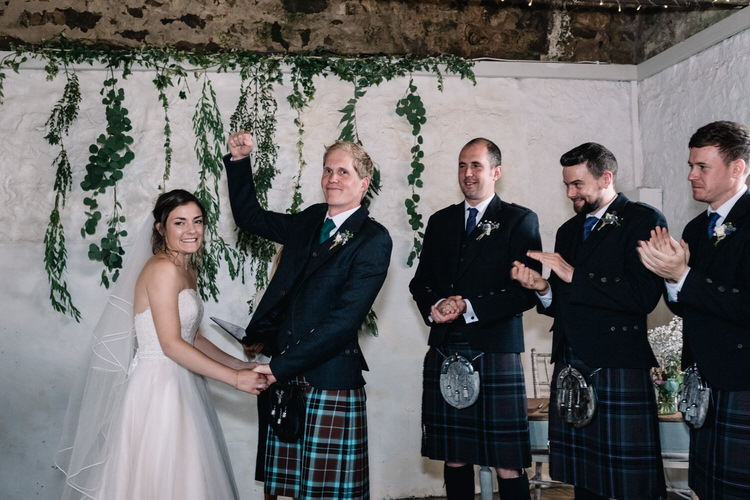 The walk down the aisle was so special, as my brother played guitar to one of our favourite songs by Mumford & Sons. 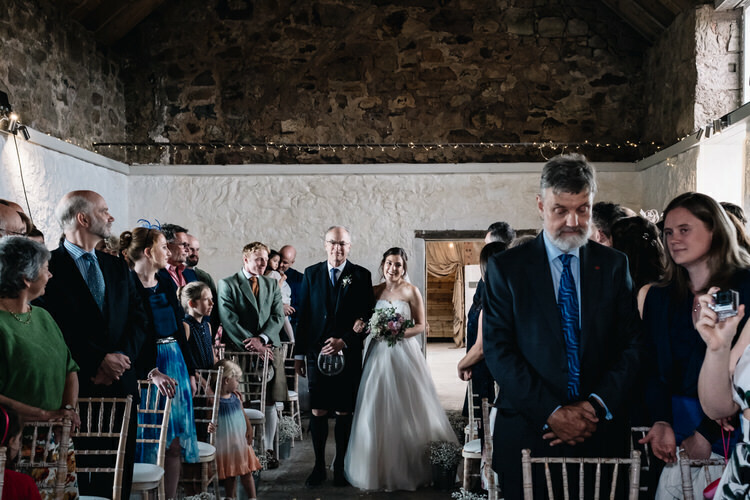 It actually started bucketing it down just as I arrived, but made for a really atmospheric ceremony as the rain hit the barn roof and big glass windows. 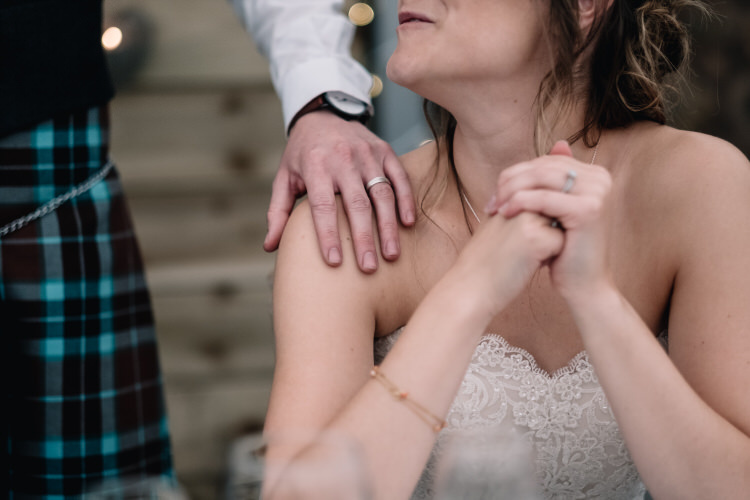 We got married by a local registrar, and she did such an amazing job (again, something which wasn’t particularly planned by us!) 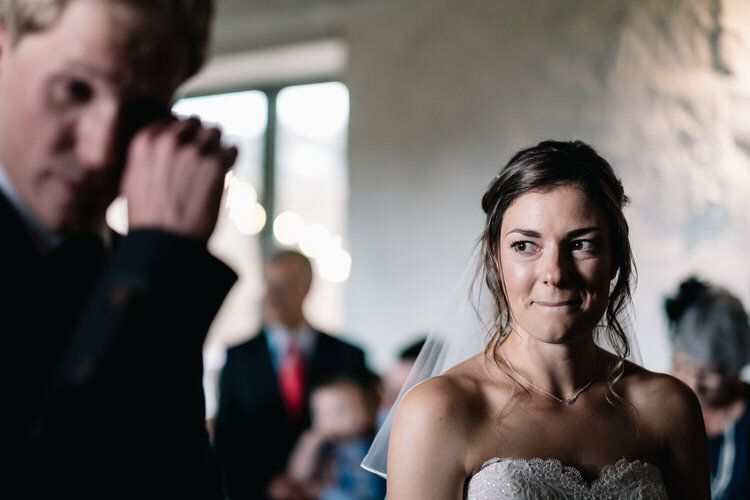 she hit just the right note of serious and funny, we’re not hugely sentimental people, so the fact that we were laughing quite a bit was perfect. The food was also such a memorable part of the day, there were so many compliments from everyone and if my dress wasn’t so tight I would have kept eating a lot more! 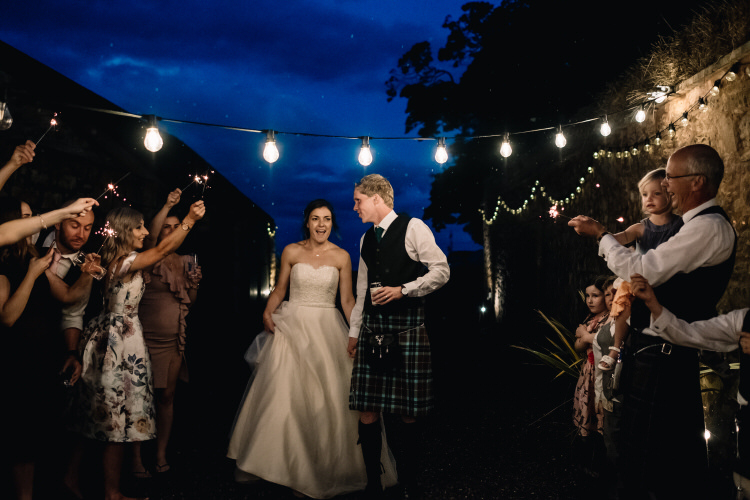 We also couldn’t have been happier with our photos, Carole-Ann captured some amazing lighting and they are so different from other wedding photos I’ve seen. Finally, I think the band have to have a mention. We found them online and didn’t get to see them live beforehand, but just a few videos online. But they were spectacular. They didn’t have a ‘set’ set list, but instead said they just adapt their songs as to what the vibe of the crowd is like. 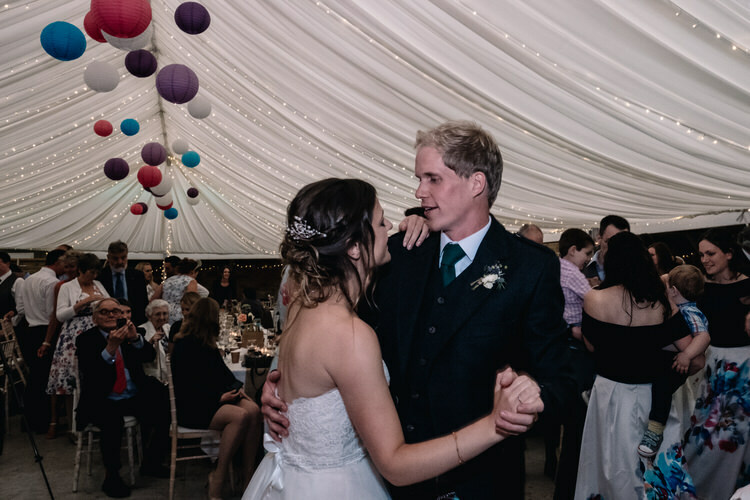 They learnt our first dance song at request (a Zac Brown Band/Van Morrison mix), and we rocked out to Purple Rain, Rhianna, The Killers, and so many more. There was such a good atmosphere on the dance floor, everyone was just in their element. Even my dad danced for a good hour or so and it takes a lot to get my dad up dancing! ADVICE FOR OTHER COUPLES | Try not to stress too much! I know it’s easier said than done. 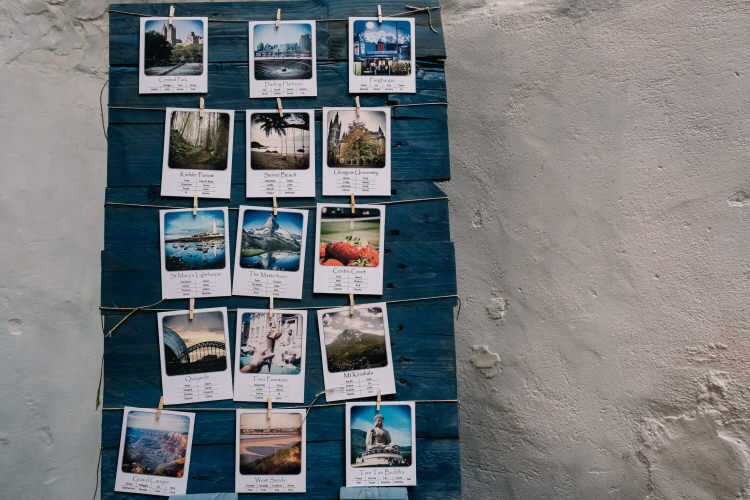 Big tip is to give yourself enough time to enjoy the planning process, do little bits at a time. Delegate on the day! 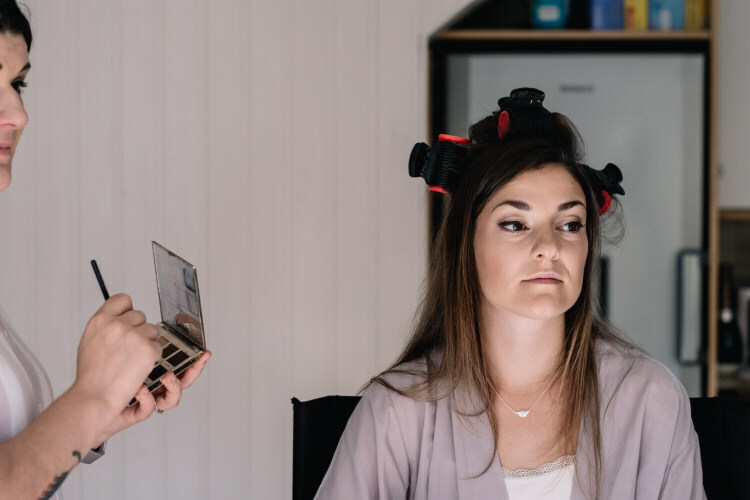 That is what groomsmen and bridesmaids are there for, to help things go smoothly so you don’t have to. Ours were amazing, I did give them a little ‘order of play’ for the day, and one or two jobs each, and can’t thank them enough for making it all run so well.